Did HTC just leak its own smartwatch? Just last week we were chewing over an artist reproduction of the alleged HTC Android Wear smartwatch, but now we've got something that feels a little more authentic. A new "behind the scenes" video from HTC is mostly made of HTC people doing HTC things, and moody shots of office lighting. But at 35 seconds in you'll notice something that looks a bit out of place. At first glance it looks a tad like the first-gen TomTom Runner, but zoom in and this is definitely a UWO (Unidentified Wearable Object). 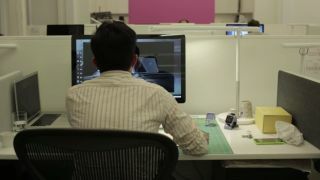 What's more, there are two visible watch stands, suggesting that it's something that HTC is in the process of testing. And if that wasn't enough to get the conspiracy theorists buzzing, the smartwatch seemingly makes a second appearance at 42 seconds where we can see another designer (possibly the same, though the desk has been moved around a bit) working on a 3D render of what also looks like a square watch face. If we're right on this, it means HTC's smartwatch looks set to be a squared-off affair. That may change before the final design, but if you're more spherically inclined, don't get your hopes up too high.